Melonie was just 27 when she met her boyfriend. After a three-year romance, Melonie got pregnant and gave birth to a baby girl. She felt isolated and unsupported throughout her pregnancy. 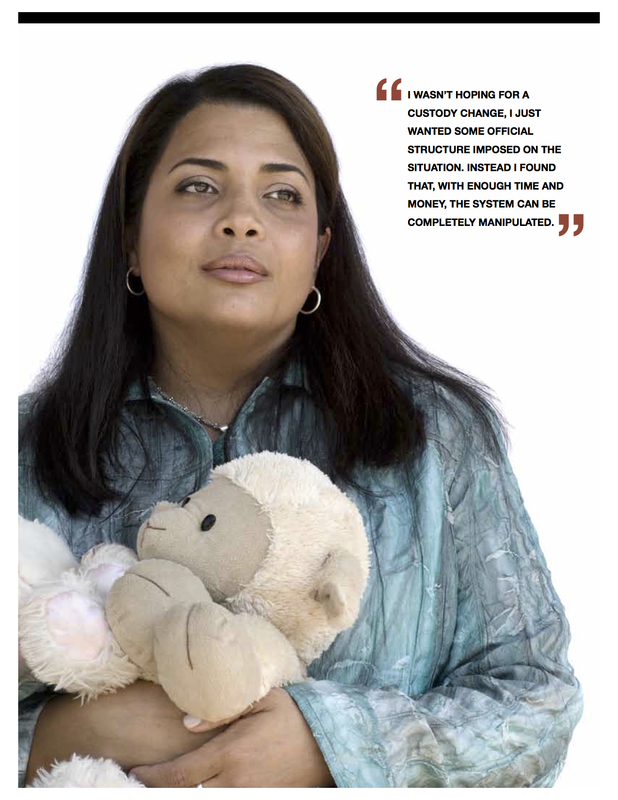 When Melonie first entered family court, she imagined that it would be a fair and just system that would impose some order on what had become very difficult dealings with her ex-boyfriend – encounters which were marked by intimidation and manipulation. Instead of finding help, Melonie found herself navigating an unpredictable system that seemed to make most important decisions in numerous ex parte hearings. Ex parte hearings are supposed to be reserved for emergency situations when a child is in harm’s way or is being taken out of the state or country by a parent. In Melonie’s case, ex parte hearings were being used for non-urgent issues such as school choice, and her ex-boyfriend’s attorney used them to file a motion for a radical change in their custody agreement. On one occasion, her daughter’s court-appointed attorney neglected to file a requested court order from the previous year to define a visitation schedule for the holidays, which resulted in yet another unnecessary ex parte hearing that generated even more conflict between Melonie and her daughter’s father. All of the court- permitted ex parte hearings have resulted in not only financial loss for Melonie, but due to the nature of their short notice, they have also forced her to retake several college courses. Ultimately these hearings have created immense stress in her life, especially since she has been forced to act as her own attorney due to the high costs of hiring attorneys for so many ex parte hearings. The commissioner ruled against the court-appointed mediator’s recommendation that Melonie maintain custody of her daughter on weekdays to give her a stable home and nearby school, since Melonie has lived in the same location for over seven years, while her ex-boyfriend has moved six or seven times during that same time period. So currently, Melonie and her daughter’s father switch custody every other week, and Melonie has to commute through horrendous traffic to get her daughter to and from school. She has also struggled to coordinate her work schedule with her daughter’s school schedule. In their five years of litigation, Melonie’s ex-boyfriend has not paid her a dime in child support, though he owns a very successful business and has significantly more resources. In fact, the court reportedly mandated that Melonie be financially responsible for her daughter’s court-appointed attorney. The court commissioner overseeing the case reportedly told Melonie, “you need to make sacrifices as a parent.” Melonie struggles to make ends meet, not to mention managing the enormous debt (totaling nearly $100,000 in personal and student loans) that she has been forced to take on in order to survive the legal onslaught being waged by her ex. Melonie’s previous attorney and daughter’s court-appointed attorney are currently threatening her with collections and fee arbitration for the $8,000 that is still owed to them.